SpaceHarp Corporation is pleased to announce the release of its Sound Galaxy 2.0 DAW Software Tools Suite. These new tools, hosted on a DAW computer, super-charges the SpaceHarp controller and fully exploits its articulate and rich live MIDI data stream. Above is the status display screen after completion of the Sound Galaxy 2.0 DAW Suite Auto-Loader. Also included and automatically pre-configured are powerful Ableton templates, remote control screens, instruments and effects packs, and SpaceHarp's powerful behind-the-scenes MIDI processing. In Sound Galaxy 2.0 these all work together seamlessly to empower a new universe of creative musical possibilities for live performance while remaining "in the flow." Sound Galaxy 2.0 gives players instant and intuitive command over a powerful set of performance-enhancing tools. These tools include DAW plug-in finely-crafted instrument presets for the popular Massive, Sylenth and Kontakt plug-ins, Ableton Sampler Packs, ready-to-play song libraries, templates, and controls for mixing and effects. Mac OS X is currently supported. Windows versions will also be supported in 2018: release date to be announced. 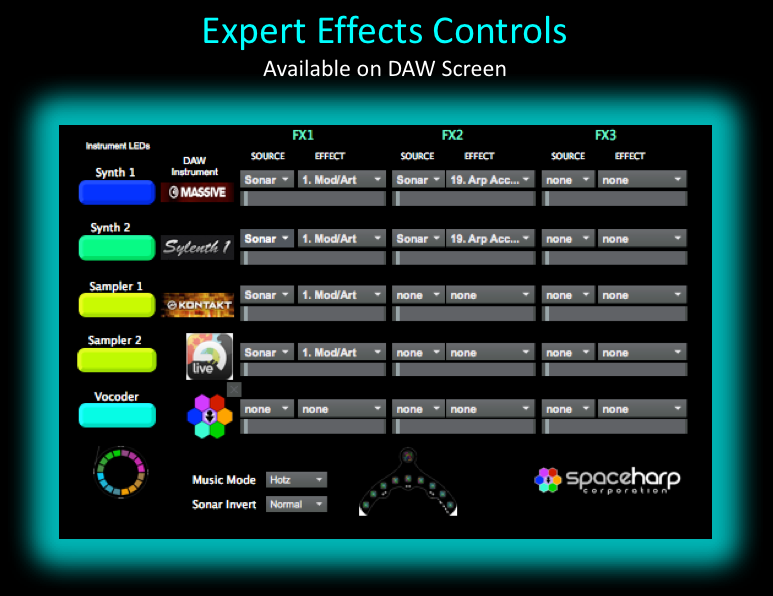 Sound Galaxy 2.0 now sports a completely new set of SpaceHarp player controls. The new controls can be run both on the DAW laptop's internal screen and/or with WiFi-connected touch-tablets. In Sound Galaxy 2.0 the Use of remotes is no longer required; they are optional. Multiple remotes may be used simultaneously, each with a different control screen by using Max Mira's Tabs. For example general public players typically use the Easy Performance controls, Location Based Hosts use both Performance and Mix Tabs, Pro Performers use Mix Tab and Pro Performers use the advanced Delta Matrix Routing and Effects Tabs, and so forth. 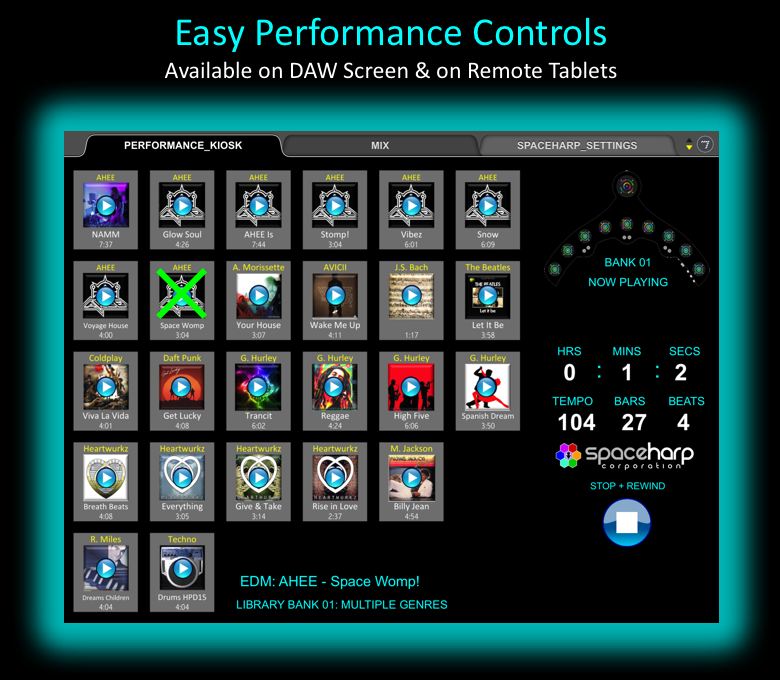 The Easy Performance Controls Tab provides single-touch to launch of pre-configured backing tracks and enhanced live musical performance. This touch-control screen fully automates all DAW instruments, presets and effects for the tracks in the displayed Library Bank. Demo Library 01 is shown. The Advanced Mix Controls Tab includes enable/disable of plug-ins; instrument layer volumes and mutes, sub mixes and mains; SpaceHarp's patented auto-quantization and sustain settings, and more. This touch-control screen provides control of DAW instruments, automation, and all the presets and effects available for the currently running song. Sound Galaxy now includes an Auto-Launcher, which boots up and configures all the DAW applications, templates, tools, instruments and effects automatically. From a start or restart, the new Auto-Launcher loads and auto-configures the suite of DAW Software. With a few mouse clicks, a Sound Galaxy 2.0 user can go from a cold power-up of the DAW laptop computer to performing. And the available controls are online whether for a stage performance, a guest-interactive experience or a multi-player theme park attraction. 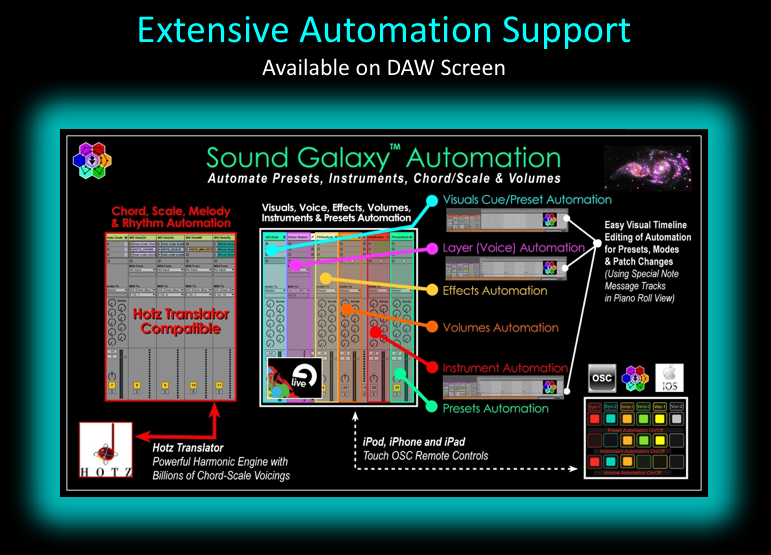 For the expert DAW user, Sound Galaxy also includes additional control screens using our Max patches. These are typically only available on the DAW computer screen, however they may also be used for remotes when control access is limited to professionals. Preset automation tracks can be created and edited easily using Sound Galaxy's TouchOSC remotes. Automation tracks in Live are supported for all DAW plug-ins, Hotz Translator auto-harmonic engine, external drum machine, external 3D video visualizers and more. "Hotz Translator SpaceHarp Special Edition" is included with all 1- and 2-SpaceHarp orders. The SpaceHarp Special Edition is not sold separately (a $99 value). With its Published IAC Bus MIDI Messages, Sound Galaxy 2.0 provides rich MIDI data streams to connected systems controlling lighting, lasers, 3D visualizers, immersive video dome visuals and VR-AR visuals. These turn-key systems are available from SpaceHarp Corporation for event rentals, long-term installations and purchase.